Today I’ll be looking at Urbana Corporation, another idea previously covered this year at various blogs (reading material @ Free NPV, Kerrisdale Capital, Barel Karsan). At the time I seriously considered buying, but in the end decided that it wasn’t quite attractive enough. Since that time plenty has happened that warrants a fresh look. Urbana is an easy to understand business that is actually not really a business: it acts as a closed end fund that invests in stock exchanges world wide. They invest in exchanges when they are privately owned and try to realize value when they are transformed to a public company. The company reports it’s NAV weekly, and was at 18 November trading at a discount of 46% to NAV. Frank Voisin has created a nice spreadsheet that updates the NAV in real time. Results have been pretty poor since the start of the financial crisis, not only as a result of the crisis it self (high trading volumes are good for profitability), but trading volumes are also moving to alternative stock exchanges in the US. NAV has dropped with nearly 50% from a peak of 260M at the end of 2007 to the current 133M. The company has been buying back reasonable amounts of stock at a discount since the beginning of 2010, reducing the shares outstanding from 87.5M to 75.5M (14%). 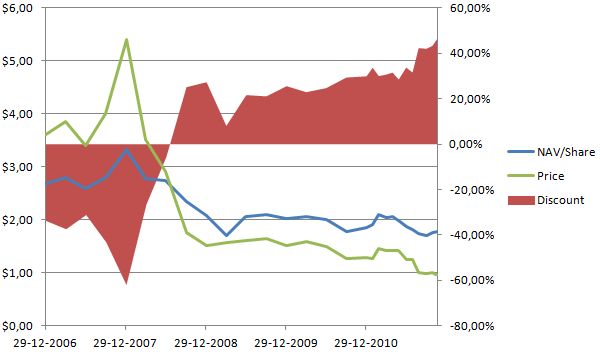 The following graph shows the historical NAV, the amount of shares outstanding, and the NAV/share. While results have been bad since the financial crisis, historical results have been pretty good. The company reports that since October 1, 2002, when Caldwell Investment Management Ltd. started managing the company’s investment portfolio, to December 30, 2010 it achieved a CAGR of 15.69%. Because of this it used to trade at a (ridiculous) premium before the financial crisis, but has been trading at a discount ever since that recently hit record highs. All numbers are based on the share price of the common shares, the Class A shares are often trading at a higher discount. So far it’s looking good: we can almost buy a dollar for 50 cents here, and if we don’t particularly like the companies Urbana invested in we can fairly easily hedge our self against the NAV dropping because the majority consists of two big liquid companies. To get the TER we need to add the management expense ratio and the trading expense ratio together. A positive note: the portfolio turnover ratio is very low, resulting in low trading expenses. The most logical way to calculate what kind of discount the shares should trade at based on these expenses, is trying to calculate what percentage of the NAV is required to cover the fees. If the annualized return on equity in the long run is 3%, and it costs 3% to run the portfolio the investment in the company is basically worthless, because it doesn’t generate a single cent of intrinsic value growth or cash flow for share holders. In that case there would only be value if the company gets liquidated at some point. With an expected annualized return on equity of 6% a discount of 50% seems suitable, because basically just half of the value generated by the business goes towards shareholders and with an expected annualized return on equity of 9% a discount of 33% is warranted. Given an average annualized return on the S&P500 of roughly 9% from 1900 till today the discount of 46% seems on the high side, but is actually not that crazy if we don’t expect that the company is going to liquidate. In the past the company significantly outperformed the S&P/TSX Composite Index that they use as benchmark, so maybe assuming market returns is a bit harsh. They have returned a CAGR after fees of 15.69% while the benchmark returned 9.98%. But with such a concentrated portfolio benchmarking doesn’t make a lot of sense. A sanity check is see at what kind of discounts closed end funds trade. Morningstar provides a list of several CEF that can be sorted on premium/discount. The biggest discount in that list is 35%, confirming that a 46% discount is big. Bit off-topic: a fascinating article I found while checking this at Morningstar is about some CEF from Cornerstone Advisors that does nothing except destroying shareholder value, and it trades at a 30% premium (don’t bother checking if it’s shortable, borrow cost is ~60%). A shareholder friendly management could easily generate great returns for share holders by simply buying back shares at a discount, and the company has been doing that for the past two years. If you look at the first graph in this post you see that since 2010 NAV/share has been diverging from NAV thanks to the buy backs. They have been buying back shares at a rate of 10%/year, and at today’s prices and with today’s 45% discount, that would add 7,548,950 * (1.77 – 0.95) = 6,190,139 dollar in value per year. Divided over the 67,940,550 remaining shares it would create an increase in NAV/share of 0.091 dollar, or 5.25%/year (while dropping total NAV with 5.36%). This is more than enough to compensate for the expenses! And if the discount drops: that is great, since that would imply that the (relative) market value of our shares is going up. The problem – for management – with the share buybacks is that buying back shares is equal to slowly liquidating the company, and the destruction of a valuable management fee. Thomas S. Caldwell made 2.4M in fees in 2010, and if we assume a zero growth rate and a 10% discount rate, the net present value of that cash flow is 24M. The management of Urbana owns 4,456,161 shares (The CEO owns the majority with 4,231,161 shares), and his son owns 1,031,163 shares for a total of 5,487,322 shares with a value of 5.1M dollars. So even though management owns 5.5M shares, there is no incentive to liquidate the business since that would result in a gain of ~5M on the shares (and freeing up 5M of capital), while giving up a cash flow that worth 20M+. The fact that Thomas S. Cardwell bought 1M shares in March this year is also not directly a positive indicator. The company has a dual class share structure with 10M common shares that have all the voting rights, and 65M Class A shares that have equal economic rights, but no vote. With the latest purchase TSC controls 47.59% of the votes, so it looks more as a buy designed to keep control over the company, and the cash flow from the management fee. But in case of a take-over bid the Class A shares would temporary get voting rights, so unless he owns more than 50% of all outstanding shares his position remains vulnerable. I’m no expert on Canadian security laws, so take this with a grain of salt. 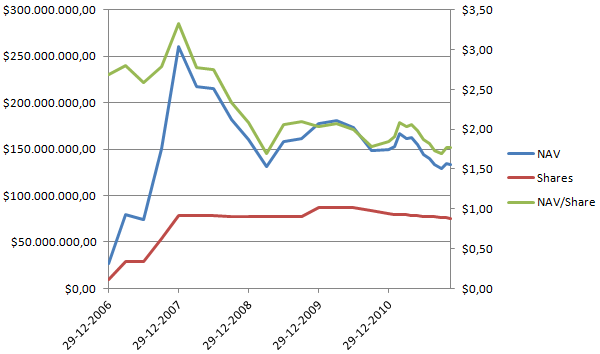 With that fact it is actually interesting that URB-A.TO is often trading at a discount relative to URB.TO. The voting rights aren’t that valuable with TSC effectively in control, and they are a lot more liquid because of the higher number of shares outstanding. In the past the voting premium has been as big as 30%, but it’s also capable of moving into the negative territory. That doesn’t have to be irrational, the higher liquidity of the URB-A.TO shares should be worth something too, but I don’t think there is a rational explanation for the rapid changes in the discount. But it might offer some opportunities in the future to profitably switch between the two share classes. In one important aspect share holder interest are aligned with the CEO, and that is with regards to not do anything stupid with the assets under management. Since he is paid a fee based on the size of the assets, he does have a strong incentive to not destroy value, since it would imply destroying their cash flow. And management having shares worth 5.1M doesn’t hurt either. In regard to Urbana’s share price, the environment of the past three years was further exacerbated by a few major Fund holders of the “A” shares becoming sellers in order to match their own fund redemptions. The nature of this selling tended to be in larger blocks directed straight into the market. The resulting discount of Urbana’s share price to the underlying asset value represented a significant opportunity for Urbana to profitably buy back and cancel “A” shares. Urbana purchased and cancelled in excess of 10% of its outstanding “A” shares as of the date of this report. Urbana’s management anticipates continuing this program, to the extent allowed under Toronto Stock Exchange regulations, as long as a significant discount continues to exist. Since then the company also announced a new share buy back program on August 25, 2011 to buy back 10% of shares. The discount between price and NAV has only grown, so I think we should expect that the share buybacks are going to continue in the foreseeable future. A good thing about that is, that it also slowly aligns management interests more with share holder interests. It increases the value of the shares of management, and it decreases the value of the management fee. But there is a limit to the amount of shares we should expect management to buy back since they don’t want to liquidate a too big part of the company. Another important consideration is the fact that Urbana is actually not a big part of the CEO’s income or wealth. Caldwell Securities, founded by Thomas S. Caldwell, list Urbana Corporation as just one of eleven funds that they manage. They also have other activities such as wealth management for high net worth individuals/institutions. He owns 44.90% of Caldwell Securities while his son owns 22.58% of the company. Screwing over share holders in URB would presumable not be good for the more important business, especially not if he ever wants to launch a new CEF in the future. And a final note about the CEO: TSC has been governor of the Toronto Stock Exchange in the past, explaining the focus of Urbana. Caldwell Investments (founded in 1980) actually runs three other funds that are exchange focused. So how exactly should we value URB? If we assume no alpha generating abilities from management a big discount because of the ~3% TER is in order. With the current discount the assets are priced as if they are able to return a CAGR of roughly 6/7% in the long run, roughly 3% below the average CAGR of the S&P500 giving us a reasonable margin of error at today’s prices. But this alone would not be enough for me. The fact that the company is buying back approximately 10% of shares/year on average, and is expected to continue this program while the discount between NAV and the share price is big, creates significant share holder value each year. The stock buy backs would add 5% to the NAV/Share, while the expenses reduce it with 3%. At the same time we are able to buy stock for almost 50 cent on the dollar. It’s not as great as buying something for 50 cent, and reselling it for a dollar in a short period of time, but it’s still pretty good. If the share buy backs would be stopped the current valuation is reasonable conservative, and if management is actually capable and able to maintain the historical CAGR the current share price is truly a steal. On a scale from 1 to 10 I give the stock an 8: buying a dollar for 54 cents is always fun and management interests are not terrible misaligned with shareholder interests. There is no true downside protection, but we can buy it ourself. This entry was posted in Portfolio and tagged URB-A.TO, URB.TO on November 29, 2011 by Alpha Vulture. This entry was posted in Off Topic on November 28, 2011 by Alpha Vulture. ADDvantage Technologies Group has been the subject of a number of write-ups on value investing oriented blogs the past month. With the stock only going down I thought that it was a good idea to do some research, and figure out if it is indeed an opportunity. Addvantage is classified as a technology company, but that’s a bit misleading. They are distributors of spare parts and keep a big inventory in multiple locations: making them the company to do business with if broken equipment needs to be replaced in a hurry. The basic long case behind AEY is the fact that the company is trading at $2.02 while NCAV is roughly $2.55 per share and is at the same time profitable with good returns on equity. The majority of this value sits in their inventories. They have 12M in cash, 10M in debt and an inventory valued at 26.7M (and you also get the properties and equipment that’s on the books for 6.9M for free). The inventory turnover ratio is currently around 1.4 which would imply that most of the companies assets could be converted to cash in a relative short period, giving the investor in AEY downside protection. I actually think that’s a bit too simplistic and optimistic. The only scenario where it makes sense for the company to try to liquidate is when the business is strongly declining, and they are unable to sell sufficient amounts of network equipment. If that’s the case, liquidating the inventory without big losses is surely going to be a difficult exercise. Having a high inventory value provides a fake illusion of safety, because exactly at the moment that the safety is needed, it’s not there. Correct me if I’m confused with another book, but I think it’s in The Intelligent Investor that Benjamin Graham talks about the liquidation value of property such as factories or real estate such as a hotel. If a company is is unable to turn a profit with it, odds are that it is simply not a profitable business to run a hotel at that spot, or produce product X. And having a factory that can produce a certain product that no-one wants doesn’t have a lot of value. It’s not quite the same with inventory, but the same principle applies. If the company is unable to sell it, it’s not going to have a lot of value. Due to the business model of AEY they are also forced to keep significant inventories, so it’s also not really an asset that can be converted to cash without hurting the business (they have reduced inventories since the peak in 2008 slightly while income has dropped hard). 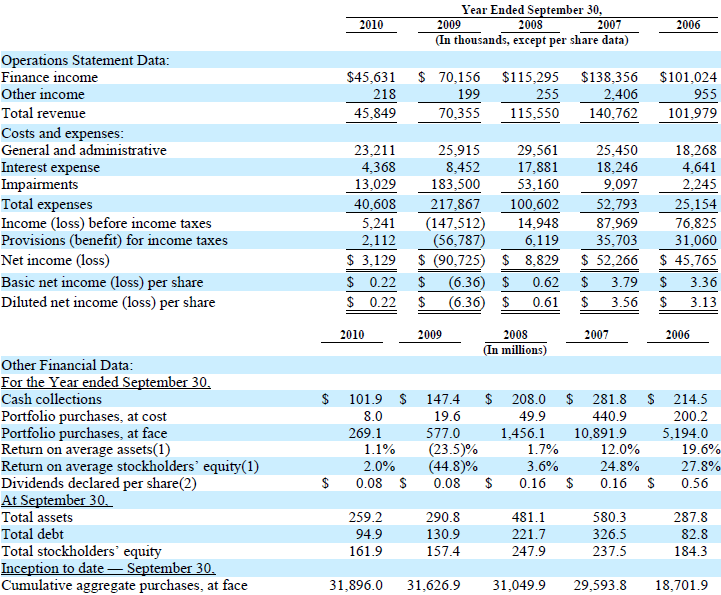 So I think it is more appropriate to value the company on the cash flows that it is able to deliver. If we take historical averages the company is absolutely undervalued. Average return on equity for the past 10 years is almost 20 percent (great! ), but things have been deteriorating since 2008 and the latest quarter was not pretty when the company reported 0.05 EPS. If we would translate that to PE-ratio we would get a 10x ratio. It seems to me that buying AEY is mainly betting on profits and margins returning to long term averages. I don’t think that is necessarily a bad thing, but I don’t think there is a real margin of safety here. If the business deteriorates further a permanent loss of capital is in my mind a very real probability and at current levels it more or less looks like a fair price. This entry was posted in Research and tagged AEY on November 25, 2011 by Alpha Vulture. To start off the blog I thought it was a good idea to do a write-up on one of my favorite idea’s of the moment. The company in question is Asta Funding Inc. (ASFI) and is in the business of buying distressed consumer debt for a few cents on the dollar, and tries to turn a profit by trying to squeeze out a bit more money from it (mostly credit card debt). The business is losing market share since 2006, and seems to be in a terminal decline. It is certainly true that the company is in a decline. Income is dropping, cash collections are dropping, and the amount of new debt the company is buying is insignificant so it’s almost a certainty that this trend is going to continue. But this is not necessarily a bad thing. The market for distressed consumer debt has become more competitive: the SumZero post notes that delinquency rates have been dropping after the financial crisis, and that other industry participants have been buying riskier portfolios that they didn’t buy before to maintain the loan reinvestment level. Not investing when expected returns are unattractive is a great decision! So if the company is in a decline, the question is basically: how much cash will it have after all debts are collected? The company is currently trading for 0.69 times book value, and while that is not bad, due to some accounting issues the true value is actually much higher. The company has at the moment 74M in debt, but this debt is non-recourse against the parent company. The company bought a portfolio (The Seneca acquisition/The Portfolio Purchase) for 300M, put in a subsidiary and used 225M bank debt to finance this. The portfolio has at the moment a book value of 80.9M versus a debt of 74M. Worst case the value of the Seneca portfolio is zero, not minus 74M. It does provide a nice free option if the Seneca portfolio produces more than that; at the moment all income from it is used to pay down the debt. collections are recognized as revenue when received. Mainly due to these accounting issues it is not directly visible that the company has at the moment almost it’s entire market cap in cash, and has assets that will probably generate enough cash over the coming three years to double this. In the latest 10-Q form for the period ending June 30 the company reported 105M in cash. The company has currently 122M of consumer receivables on the books, 34M is accounted using the interest method and 88 Million is accounted using the cost recovery method. So in three years time almost all the debts should have been collected, resulting in roughly 1.3 * 32M = 41.6 M and a profit of 9.6M that, after 35% taxes, is 6.2M. The 88 Million on the books using the cost recovery method is mostly part of the Seneca portfolio, and all cash flow generated from this portfolio is used to pay down debt. Just 7M of this 88M asset generates cash flow that goes towards ASFI and it shareholders. Given the fact that a lot of debt in the cost basis portfolio generates significant cash flows after they have been written down to zero I would expect that they can probably recover this 7M. If the company would be able to maintain these cashflows for 3 more years that would roughly result in 104M in cash that all go towards earnings. In reality the cash flows will start to decline, but they will also continue for much longer than 3 years. On VIC, that contains an excellent write up on ASFI, the author had a phone call with Asta’s CFO who indicated that there is no reason to expect a change in the pattern of cash flows. We do have to account for taxes though since the money from the zero basis portfolio’s goes straight towards income. With a 35% tax rate the 104M would net 67.6M. The company does have a deferred income taxes asset valued at 17.3M and a liability of 4.4M for a net asset of 12.9M that can be used to eliminate some of these taxes. So if we add all this up we get 105 + 32 + 6.2 + 7 + 67.6 + 12.9 = 231M vs a market cap of 116M now, implying roughly a double in three years time. The company wrote down a big part of their portfolio in 2009. Instead of assuming that they would be able to collect the book value of the debts in the interest accounting bucket in 18-24 months they extended this to 24-39 months. And instead of taking five year to collect 130-140% they now assume they will take seven years. 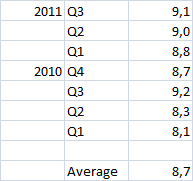 This created a big loss on paper (see reported income for 2009) and a deferred income tax assets worth 17.3M. The IRS has started an audit, presumably related to the impairments in 2008 and 2009. This should have no material effect on the value of the stock. They might be required to move the payment of some taxes forward (and potentially pay some penalties), but in the end they have to pay taxes over the same amount of income. What will be done with the cash? With all this cash the biggest question is: what will be done with it? Management destroying shareholder value by overpaying for companies is unfortunately all too common, and management has indicated that they are looking to acquire a company. Management/The Stern Family has significant skin in the game. The Stern family (The CEO is Gary Stern, and Arthur Stern – the founder – is active on the Board) controls more than 26% of outstanding shares. They have been careful not to overpay for distressed debt, so I’m reasonable confident that they are not willing to massively overpay, just so they can continue to play CEO. And with presumably 230M in cash by 2014 they need to do something incredible stupid to destroy so much value when we are starting with a 116M market cap right now. On December 14, 2009, the Company and its subsidiaries other than Palisades XVI, entered into a revolving credit agreement with Bank Leumi (the “Leumi Credit Agreement”), which permitted maximum principal advances of up to $6 million. This agreement expired on December 31, 2010. The interest rate was a floating rate equal to the Bank Leumi Reference Rate plus 2%, with a floor of 4.5%. The loan was secured by collateral consisting of all of the assets of the Company other than those of Palisades XVI. In addition, other collateral for the loan consisted of a pledge of cash and securities by GMS Family Investors, LLC, an investment company owned by members of the Stern family. Also very positive: The company has announced a share buyback for 20M, roughly 17% of the stock outstanding at current market prices, and that should add significant share holder value since they are buying it back while it is significantly under priced. The Seneca portfolio is an option that could provide some cash flow if they are able to pay off the 74M of debt that is left, but this is questionable. In the past 9 months they have reduced the debt from 90.4M to 74.2M and at that rate it’s going to take roughly 4 years before the debt is payed down. Since cash flows from bad debts dry up over time it is doubtful if they will ever be able to do that. But an almost free (company does have costs running the portfolio) option is not bad. At the time of this writing ASFI should have it’s market cap in cash (they reported 105M on June 30, and they have easily generated the missing 11M by now) and with a significant free cash flow in the following years it is hard to imagine a scenario that could result in a permanent loss of capital. The might recover less of the debts if the economy deteriorates and/or management could destroy value with an acquisition. But getting below the current value is going to be pretty hard. At the same time management interests seems to be aligned with share holders, management seems conservative, and the 20M buyback is a good way to spend some of the cash. One thing that I haven’t noted so far, but actually is pretty relevant is that the company uses mostly third party collection agencies and attorneys, so the cost structure is very flexible. On a scale from 1 to 10 I give the stock a 9, mainly because the downside is well protected. Whopper Investments also presents the long case, and has also a reaction on the SumZero short case. This entry was posted in Portfolio and tagged ASFI on November 23, 2011 by Alpha Vulture.